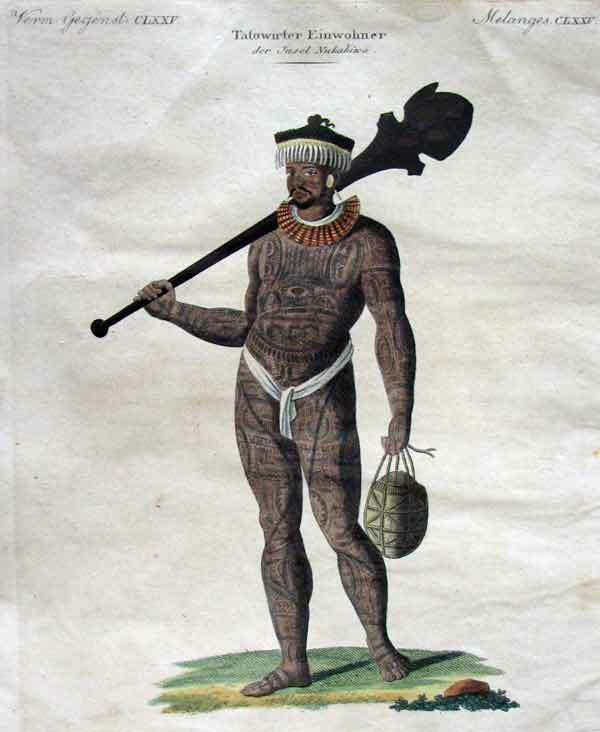 Rare hand coloured stipple engraving, From the very rare French voyage account, "Voyage autour du monde" under the command of Louis de Freycinet. Who was also on the Baudin voayge. 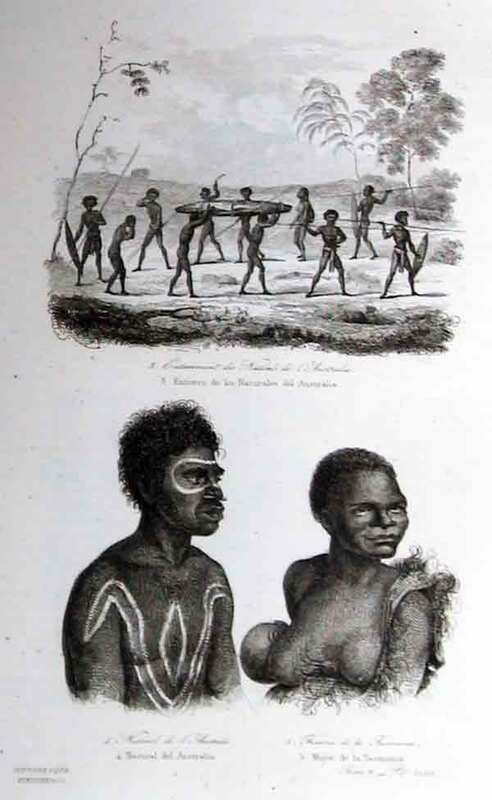 Artist and naval draughtsman, was a midshipman aboard l'Uranie under the command of Louis de Freycinet expedition in 1817. Pellion assisted the official artists J. Arago and A. Taunay during the three-year voyage around the world. 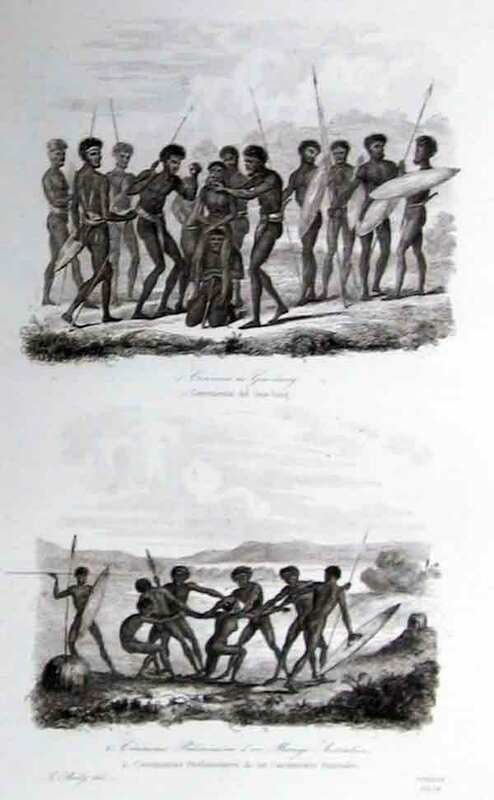 On 12 September 1818, l'Uranie reached Shark Bay, WA, where a camp was established.The expedition struck camp and sailed for Timor a fortnight later. 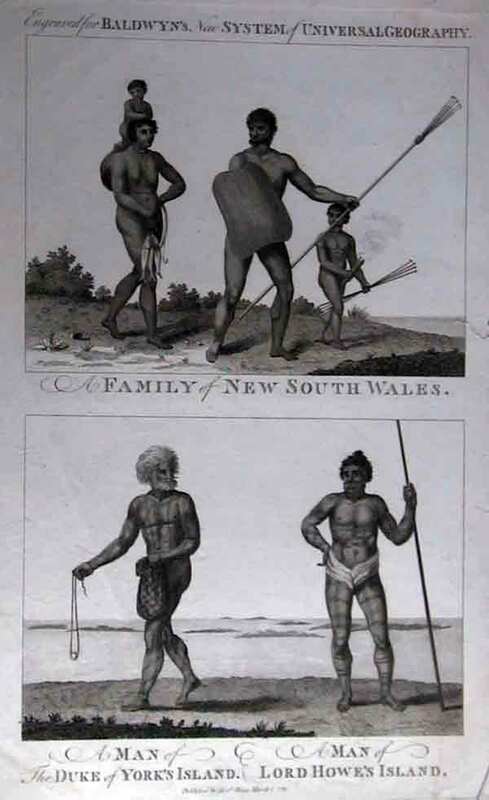 It then sailed into Port Jackson on 18 November 1819 where they were made welcome by Governor Macquarie, who entertained them at both Sydney and Parramatta and permitted both artists and scientists to wander freely. 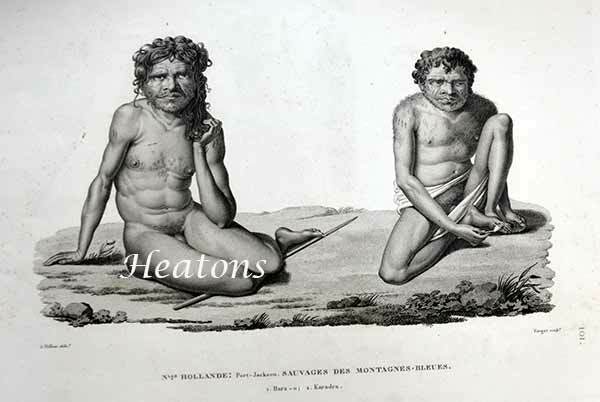 De Freycinet had intended Arago to accompany them, but his place was taken by J. Alphonse Pellion (fl. 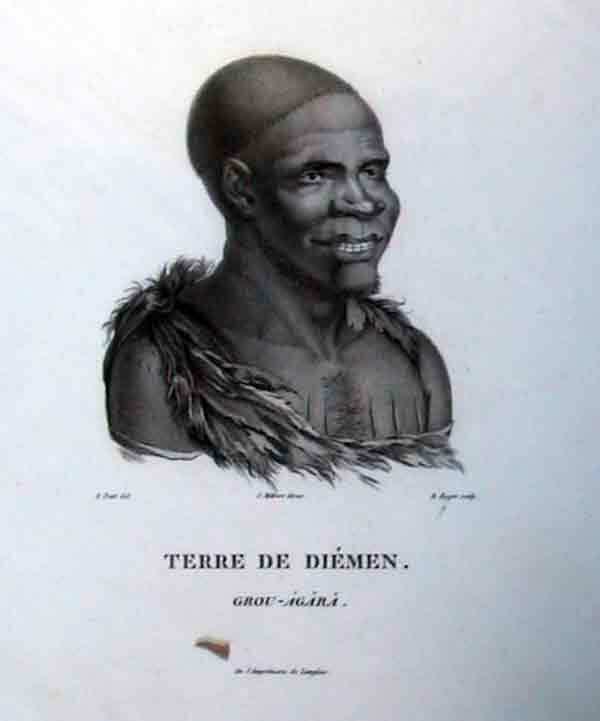 1817-20) 'whose zeal, activity and courage never failed him in dangerous enterprises, and whose talents as a draughtsman rendered him equally proper for this mission'.Size plate mark 32 x 27.7 cm/ Plate from: 'Voyage autour du monde' : entrepris par ordre du Roi ... execute sur les corvettes de S.M. l'Uranie et la Physicienne, pendant les annees 1817, 1818, 1819 et 1820 ...1825 /­ par M. Louis de Freycinet. Paris : Chez Pillet Ainé, Imprimeur-Libraire, Rue des Grands - Augustins, N. 7, 1826. 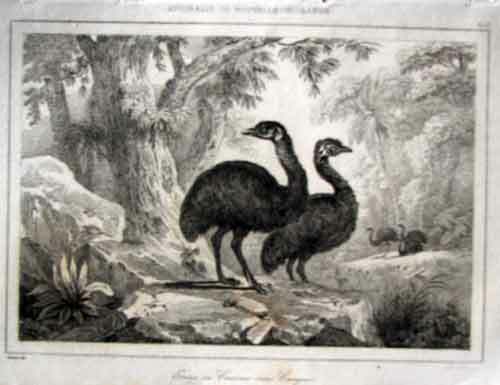 NICOLAS THOMAS BAUDIN,(1754-1803) and LOUIS-CLAUDE DESAULSES DE FREYCINET,(1779-1842) worked as cartographic surveyors and naturalists. 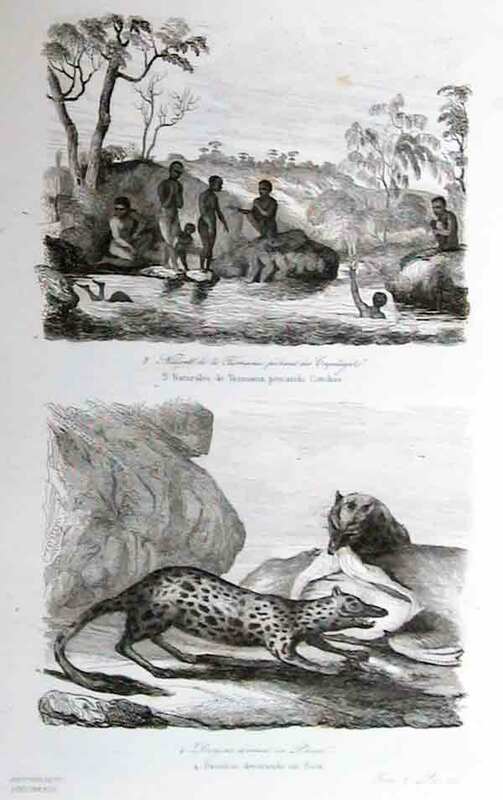 Baudin born on 19 February 1754 at St-Pierre-de-Ré, France. He joined the navy as a cadet in 1774 and in 1786 was promoted sub-lieutenant. Freycinet born on 7 August 1779 at Montélimar, Drôme, and joined the navy in 1793. 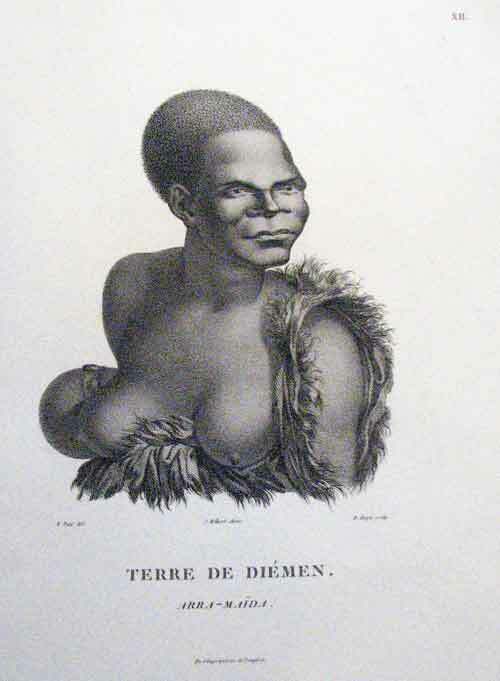 Pellion was a topographical painter, naval draughtsman and midshipman aboard l'Uranie under the command of Louis de Freycinet during the voyages of 1817-1820. 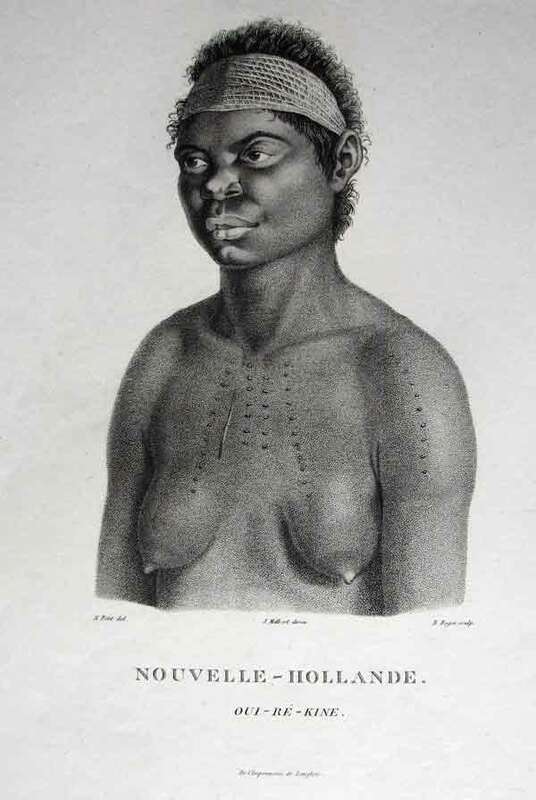 Pellion made many sketches in NSW, including views of Cox's Pass and Cox's River and portraits of the local aborigines. topographical painter and naval draughtsman, was a midshipman aboard l’Uranie when it left Toulon, France, on 17 September 1817 under the command of Louis de Freycinet . Pellion assisted the expedition’s official artists J. Arago and A. Taunay during the three-year voyage around the world. 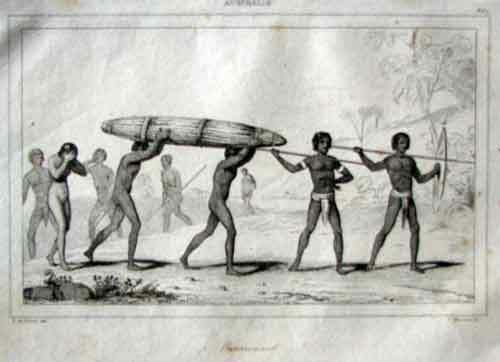 On 12 September 1818, l’Uranie reached Shark Bay, WA, where a camp was established. Pellion’s Baie des Chiens Marins, Camp de L’Uranie is in the NLA. 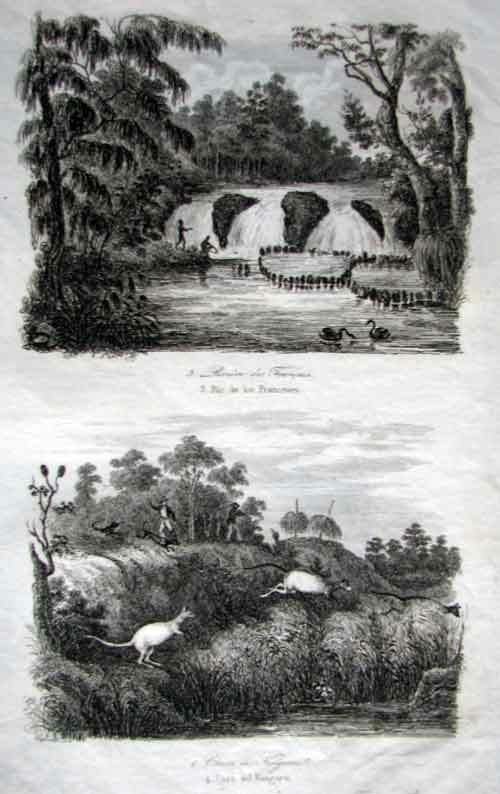 The expedition struck camp and sailed for Timor a fortnight later. 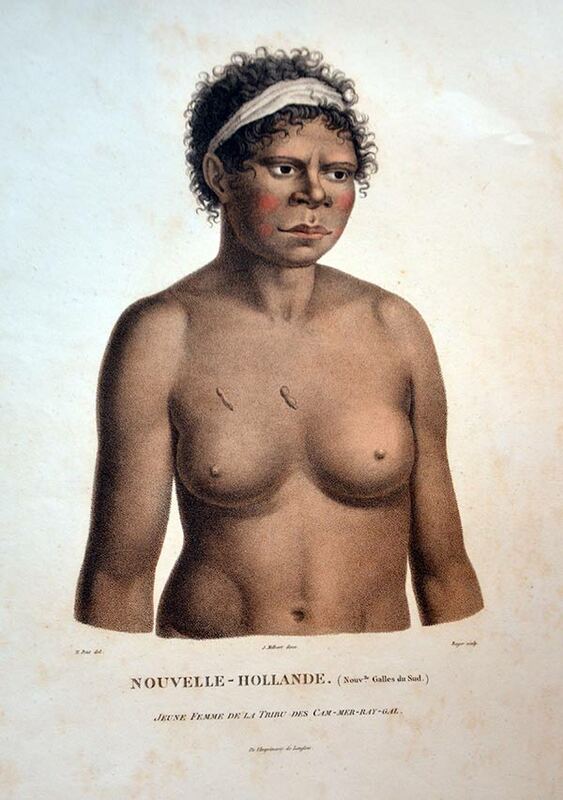 L’Uranie sailed into Port Jackson on 18 November 1819. 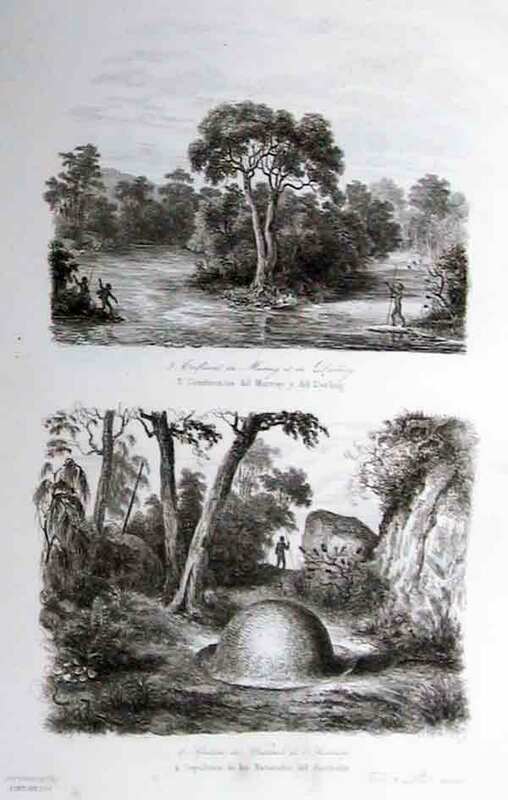 Rare uncoloured stipple engraving, From the very rare French voyage account, "Voyage autour du monde" under the command of Louis de Freycinet. 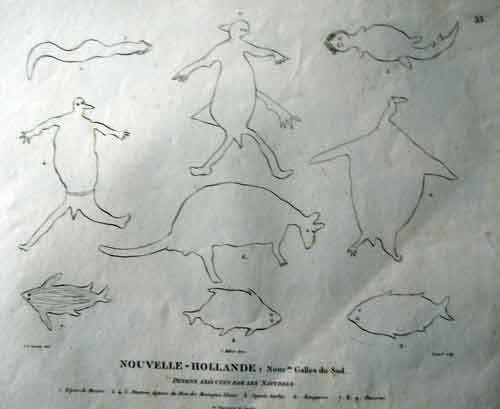 Who was also on the Baudin voayge. 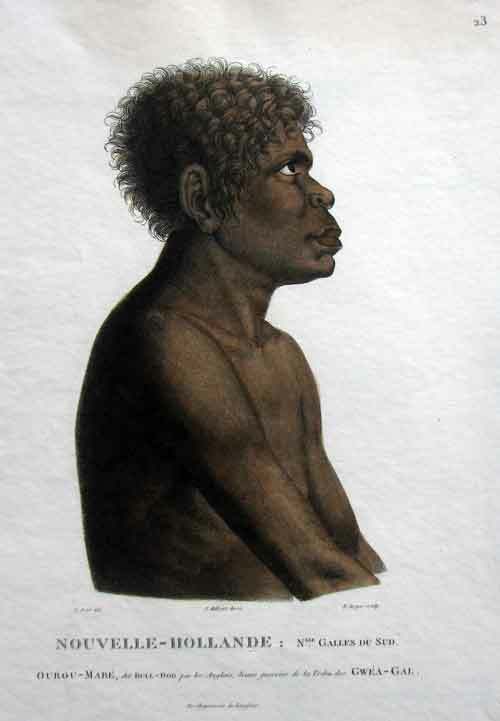 Artist and naval draughtsman, was a midshipman aboard l'Uranie under the command of Louis de Freycinet expedition in 1817. Pellion assisted the official artists J. Arago and A. Taunay during the three-year voyage around the world. 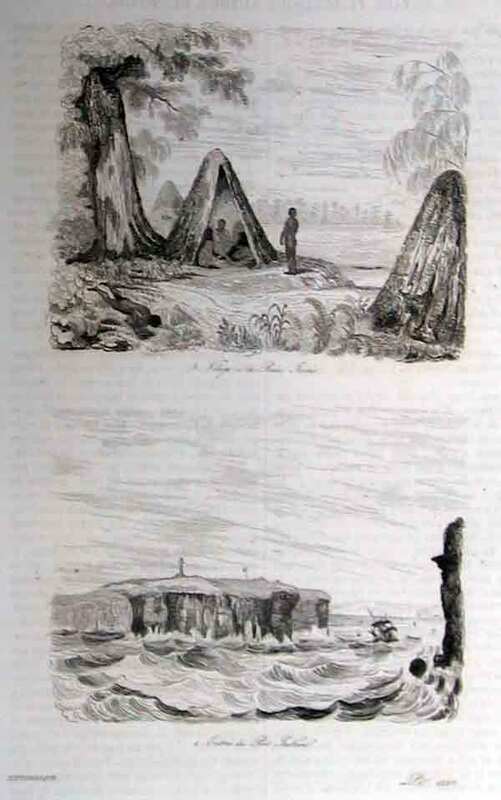 On 12 September 1818, l'Uranie reached Shark Bay, WA, where a camp was established.The expedition struck camp and sailed for Timor a fortnight later. 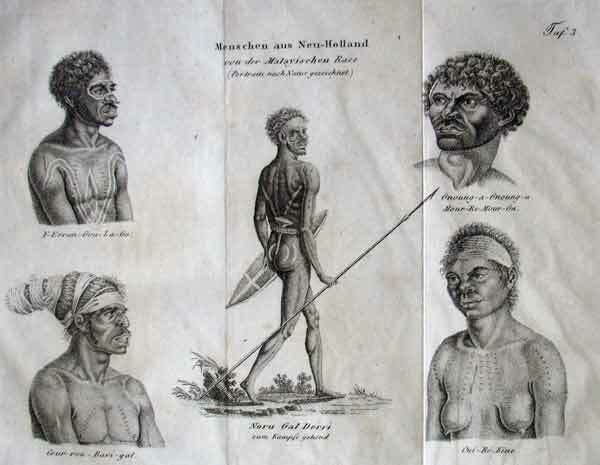 It then sailed into Port Jackson on 18 November 1819 where they were made welcome by Governor Macquarie, who entertained them at both Sydney and Parramatta and permitted both artists and scientists to wander freely. 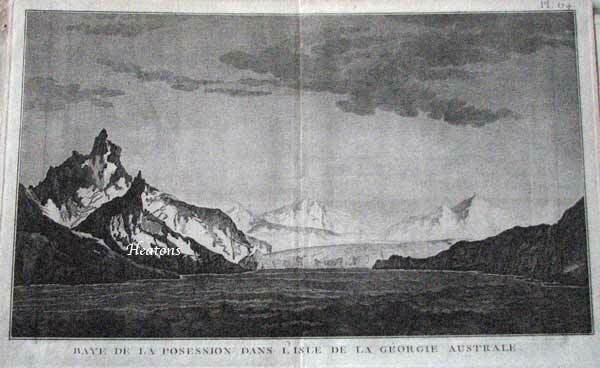 De Freycinet had intended Arago to accompany them, but his place was taken by J. Alphonse Pellion (fl. 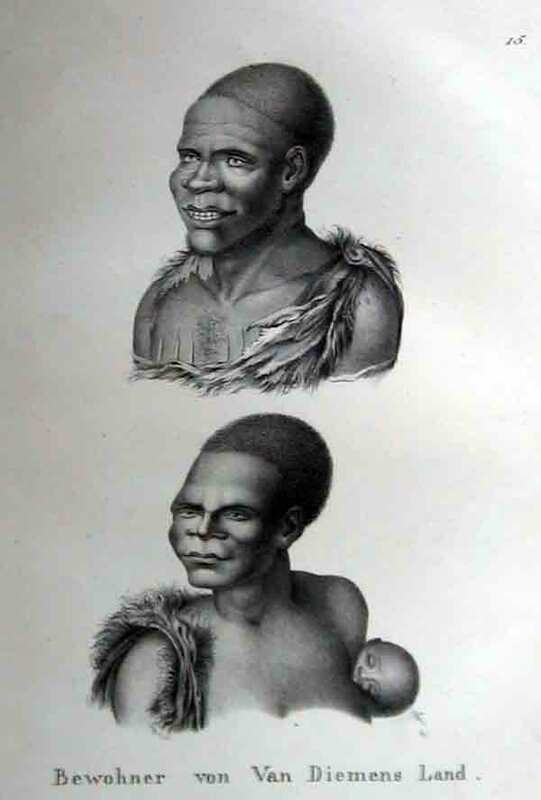 1817-20) 'whose zeal, activity and courage never failed him in dangerous enterprises, and whose talents as a draughtsman rendered him equally proper for this mission'.Size plate mark 32 x 27.7 cm/ Plate from: 'Voyage autour du monde' : entrepris par ordre du Roi ... execute sur les corvettes de S.M. 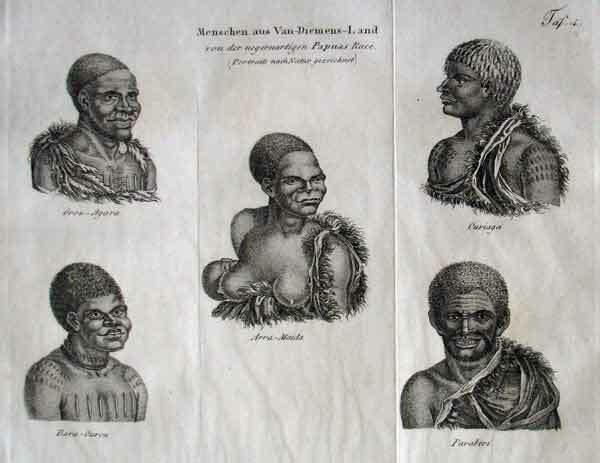 l'Uranie et la Physicienne, pendant les annees 1817, 1818, 1819 et 1820 ...1825 /­ par M. Louis de Freycinet. 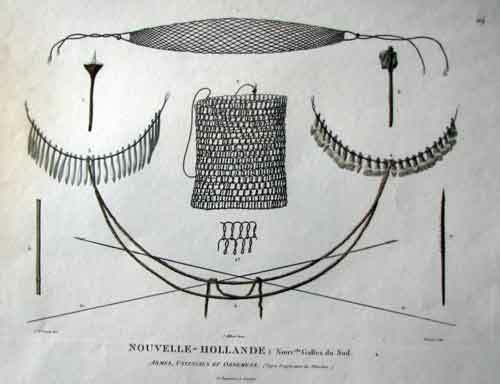 Paris : Chez Pillet Ainé, Imprimeur-Libraire, Rue des Grands - Augustins, N. 7, 1826. 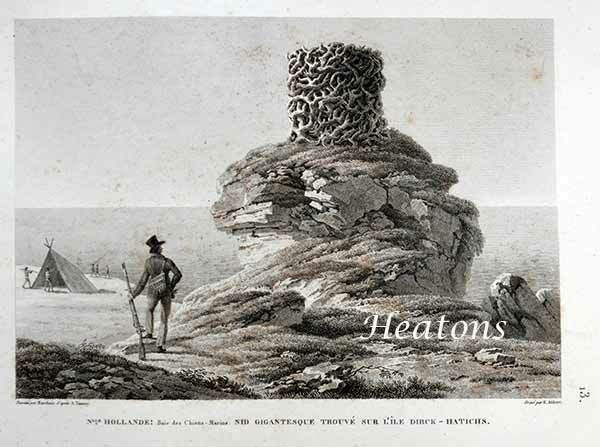 NICOLAS THOMAS BAUDIN,(1754-1803) and LOUIS-CLAUDE DESAULSES DE FREYCINET,(1779-1842) worked as cartographic surveyors and naturalists. 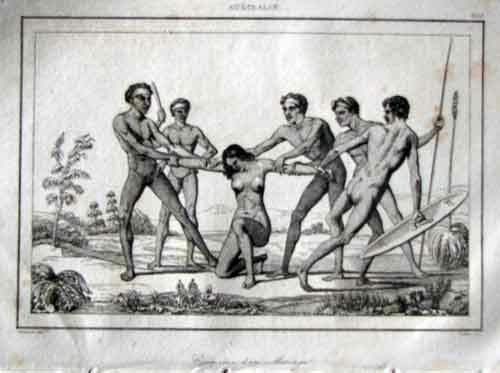 Baudin born on 19 February 1754 at St-Pierre-de-Ré, France. He joined the navy as a cadet in 1774 and in 1786 was promoted sub-lieutenant. Freycinet born on 7 August 1779 at Montélimar, Drôme, and joined the navy in 1793. 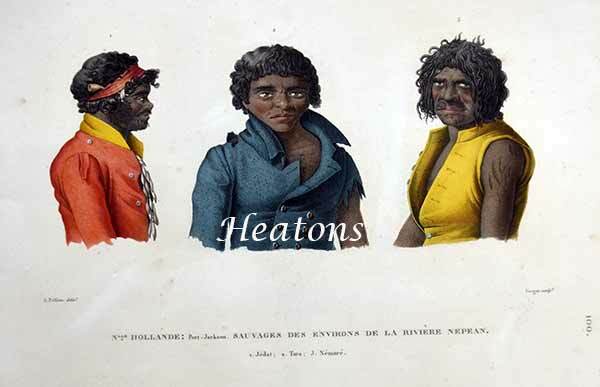 Pellion was a topographical painter, naval draughtsman and midshipman aboard l'Uranie under the command of Louis de Freycinet during the voyages of 1817-1820. 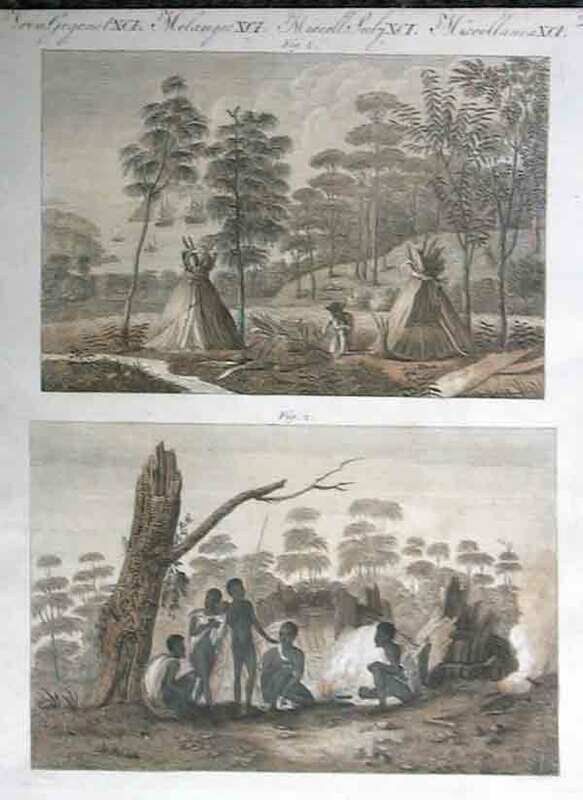 Pellion made many sketches in NSW, including views of Cox's Pass and Cox's River and portraits of the local aborigines. topographical painter and naval draughtsman, was a midshipman aboard l’Uranie when it left Toulon, France, on 17 September 1817 under the command of Louis de Freycinet . Pellion assisted the expedition’s official artists J. Arago and A. Taunay during the three-year voyage around the world. 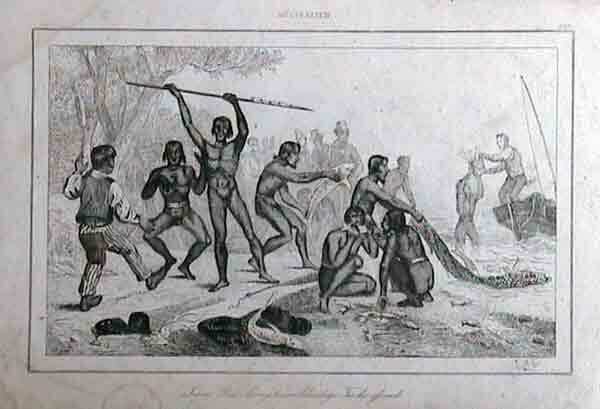 On 12 September 1818, l’Uranie reached Shark Bay, WA, where a camp was established. Pellion’s Baie des Chiens Marins, Camp de L’Uranie is in the NLA. 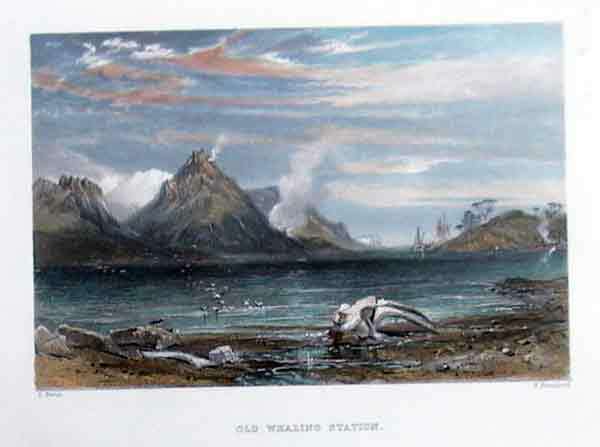 The expedition struck camp and sailed for Timor a fortnight later. L’Uranie sailed into Port Jackson on 18 November 1819. A New & Accurate Chart of the Discoveries made by the late Capt. Js. 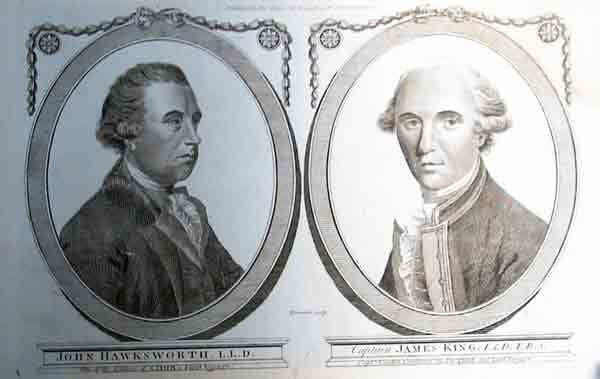 Cook, and other distinguished Modern Navigators . 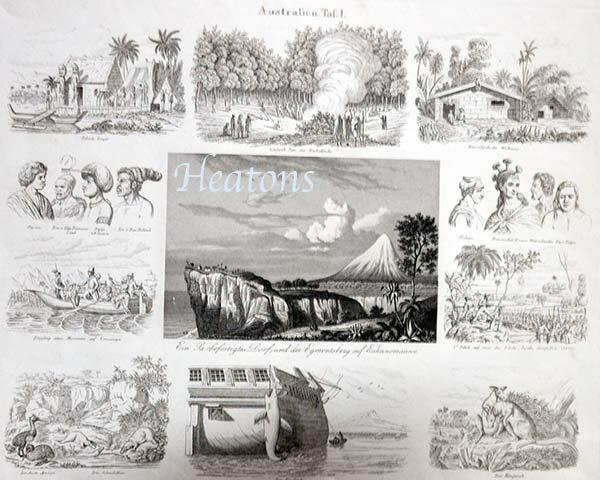 . . Exhibiting Botany Bay, with the whole Coast of New South Wales in New Holland; Also New Zealand,, Norfolk and the various other Islands situated in the Great Pacific . . . 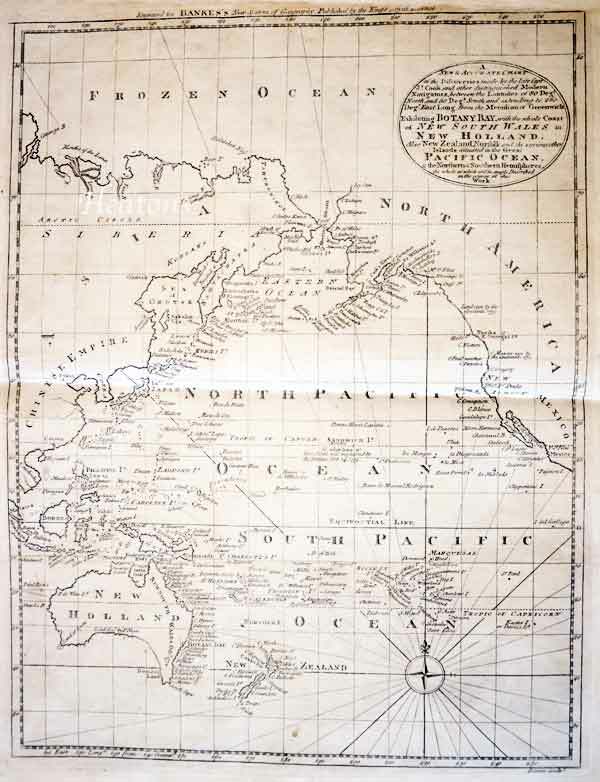 Chart of the Pacific by Emanuel Bowen:of the contiguous coastlines, showing the tracks of Captain James Cook and discoveries explorers in the Pacific Ocean in the second half of the 18th Century.Showing the whole of the Pacific highlighting Cook's achievements, and includes a note regarding his murder in the Sandwich Is., "O-why-hee" (Hawaii) . Classic cartographic errors include Banks Peninsula, Stewart Is., Tasmania.Published London / 1787 Size: 18 x 13.5 inches £295 inc delivery fold as issued re margined top edge and left side otherwise stunning condition for a rare map. 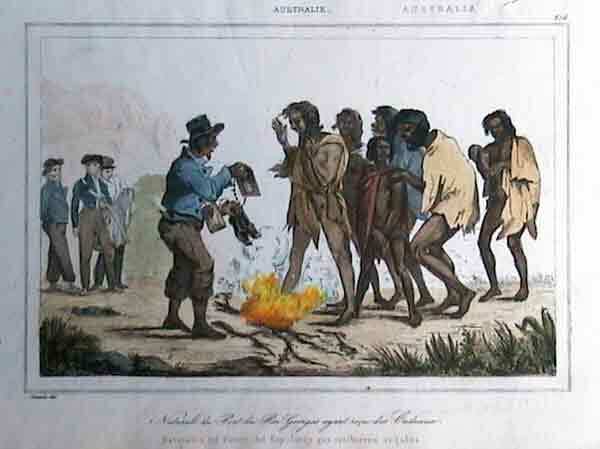 NEW SOUTH WALES: The Oldest and Richest of the Australian Colonies. 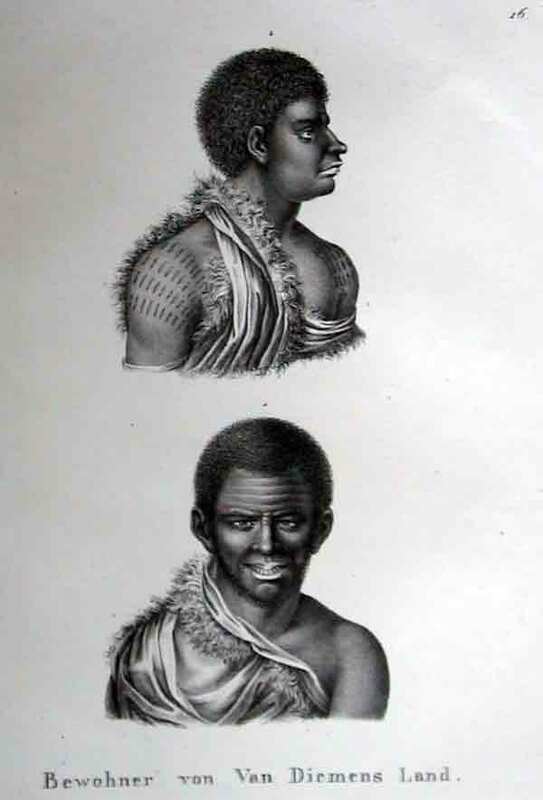 from Voyages de Découvertes aux Terres Australes by François Péron (c1775-1810) was the naturalist on board the voyage of Nicolas Baudin to Australia and the Pacific in 1800–04.Baudin died on the return voyage, in September 1803, and it fell to Péron to prepare the results of the voyage for publication.His atlas of historical views, titled Voyage of Discoveries in Terra Australis, is without doubt one of the finest publications ever issued on Australia. 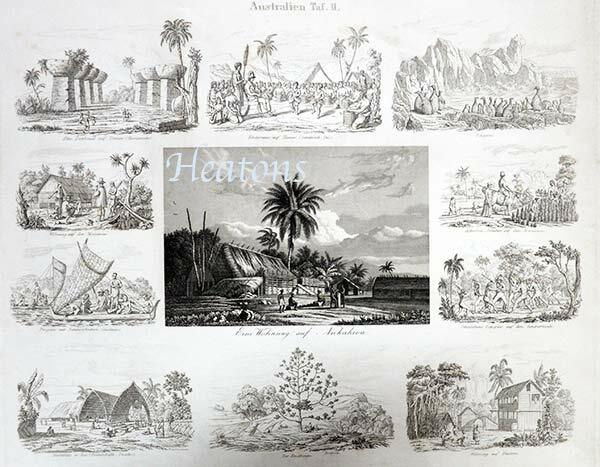 It includes the first printed map of the entire continent, predating Matthew Flinders’ map by several years, and the first European notation of Aboriginal music.The detailed illustrations were produced by Charles-Alexandre Lesueur and Nicolas-Martin Petit official artists on the voyage, and printed in Paris by Dirigé par J Hilbert : de l'Imprimerie de Langlois, in 1807.Image plate mark 24.6 x 32.2 cm. 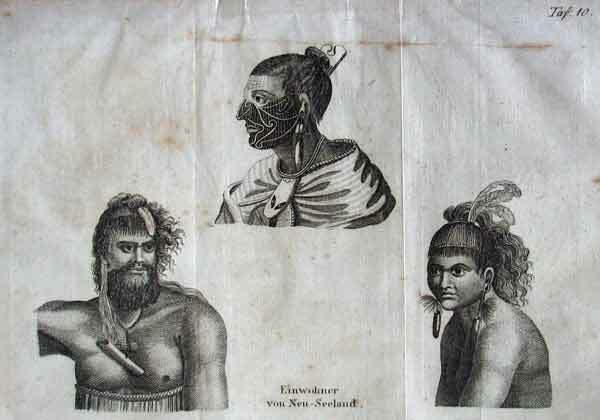 Lithograph by J. Honegger from “Naturgeschichte und Abblidung des Menschen..." by HeinrichRudolf Schinz. Zurich, 1845. (Native people of the world). Bewohner beiderley geschlechtes von Vandiemensland. 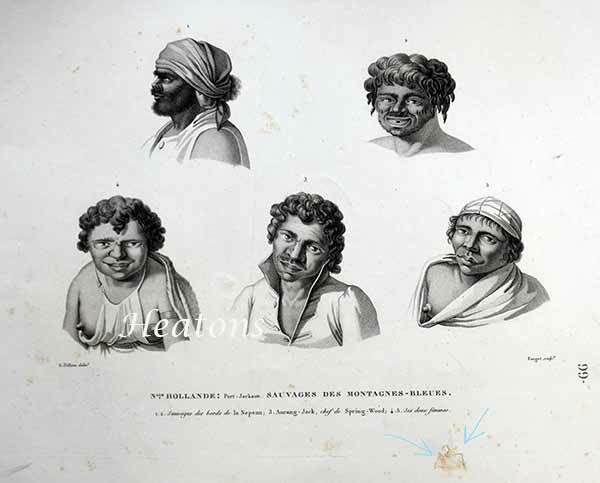 Australian Aborigines: Grou Agara; Couriaga; Bara-Ourou; Paraberi; Arra-Maida (with child oon back in kangaroo papoose). 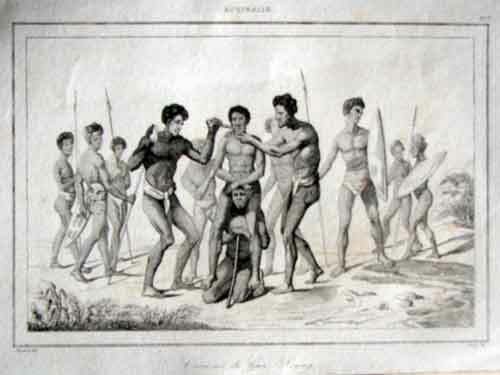 Australian Aborigines: Y-Erran-Gou-La-Ga; Gnoung-a-Gnoung-a, Mour-Re-Mour-Ga; Cour-rou-Bari-gal; Ou-Re-Kine; Noru Gal Derri zum Kampf gehend (going to fight).